A Pipistrelle, a Peregrine and a Pilgrim in extra time. For some of us in humankind birds are quite uplifting. 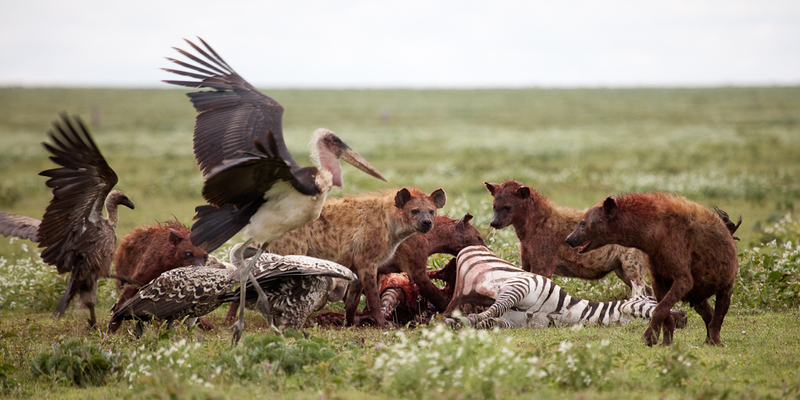 Have you ever wondered how different our ‘development’ might have been if we, the most manipulative creature to evolve upon this planet, had been able to fly rather than to simply run? Instead of which ‘our’ Earth has suffered most terribly from the hands-on brain approach of an ape whose primary goal is to bend everything to its own sad and limited will. To “His will”. The will of an ape who worships invisible gods in the heavenly sky – of late an all-seeing, vengeful surveillance God. A god in the man’s own image, who likes to lord it over every other living thing. What a terrible, tragic misreading of the facts! Frequently, in the course of over fifty-six years of going outside, birds have lifted me heavenward. The that first I remember clearly were some ducks on a pond. They were wintering ‘Soviet’ Tufteds and Baltic Pochards swimming in tight circles, right at my bread- laden fingertips, in Saint James’s Park in central London. That same year, I think it was, enraged Arctic Terns drew blood from my fourteen year old brother’s scalp. And Dad’s big brown brogues gently lifted an Eider from gorgeous green eggs in a cradle nest of softest down, on Inner Farne, an island nature reserve, one glorious Whitsunday. Soon I became aware of added-value, of scarcity. A ten year old friend and I stumbled once upon a Firecrest as we stealthily crept like pygmies through a willow thicket at the back of Bruton Park, in Birmingham, one gloomy morning in March ’63. I did not know what kind of bird it was. Some waif from the east I thought, based on my knowledge of our big, old bird book, one by Reverend Lewis Bonhote Birds of Britain. Until I got home to that book I believed it might be asuper rarity. Funnily enough the elders in my family had already tried to string the Firecrest, which this was, out of Goldcrests, when these tiny birds fed among frosted rose bushes at our dining-room window, during the exceptionally hard winter of 62-63 that had just ended. 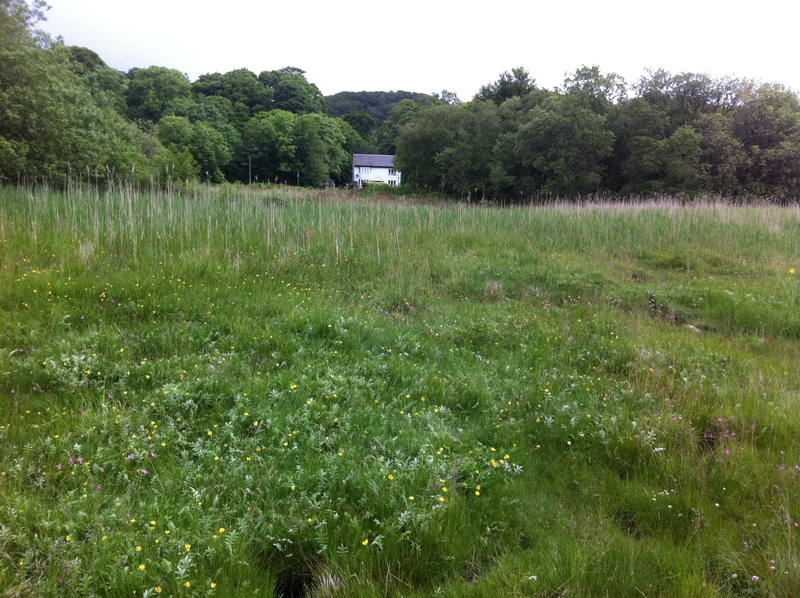 West Loch Tarbert, Argyll – the house in summer. Fast forward nearly forty years to the last few months of what I would call “normal time” – in 2001. A driech and gloomy February afternoon, beside a boggy carr at the edge of a sea-loch near Tarbert in mid-Argyll, Scotland. A shaven-headed and bearded man, in thick brown woollen jumper and baggy cargo pants, is feeding a mixed seeds (yellow millet and black sunflower) to a flock of two or three hundred birds, Chaffinches in the main, at a clearing in the ancient oak wood beside his rented house. The Chaffinches and several Bramblings have temporarily retired to the nearby birch scrub that almost encircles the glade. A tiny brown pipistrelle bat flutters, flickering-in, and commences dizzy rounds, just above my head. Round and round the glade it goes, capturing winter gnats. Quiet, motionless, with a plastic jug of seed hanging in my left hand, I watch the foraging antics of this diurnal bat. My head indeed is tilted heavenward. All of a sudden there is a rush of air at my right ear. A brown-backed Peregrine (bird of the year) hurtles past me into the glade. The falcon attempts to grasp the bat, by coming at it from beneath, but misses. The big bird rises out of the glade then turns and stoops. But misses again. Bat and falcon then circle together, they spiral, above me against they soft grey sky, for a time that I can never gauge. Eventually the bat escapes, finds sanctuary by jinking through a tight mesh curtain of birch twigs. Then the falcon rises and is gone. And I’ll swear to all and anybody’s god that I was hovering there, a centimetre above the ground, my mouth agape no doubt. Hovering Aloft. Transfixed. Beside myself with all Creation. So you see, that’s owhy I love birds! What with all the torrential rain – think surging equatorial highland luxuriance – there’s not much bare ground remaining, and I simply don’t have the time, or energy, to root about nor pretend to wallow (as a middle-aged Bush Pig or Wild Boar might ) to create those essential openings so necessary for the ground feeding birds. 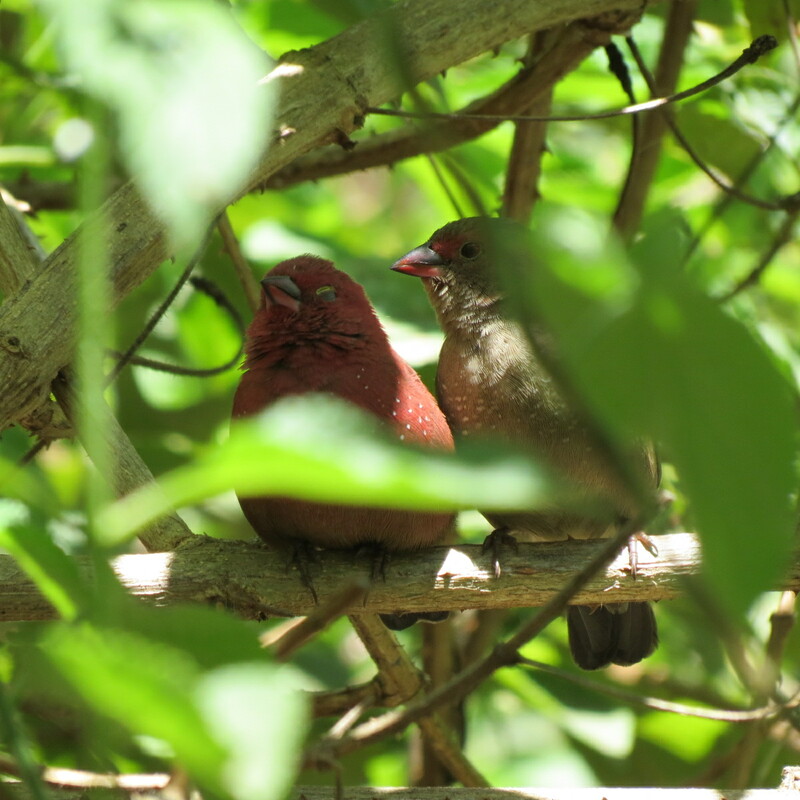 Birds such as these two delightful Red-billed Firefinches pictured here, allopreening outside my study window. However all this rioting chlorophyll, xylem and phloem leaping towards a waxing moon, means that some unusual post-breeding avian wanderers have been dropping-in to shelter with us in this Ornithological Oasis. International Worker’s Day saw the spectacularly named Grey-Olive Greenbul added to the garden list and they are still here. In the past week I’ve also heard the mellow “OObs” of Spotted Eagle-Owl in the early, early hours, whilst an Olive Sunbird nattered here for a full eight days and this past week-end a moulting adult Jacobin Cuckoo (Black-and-White) was watched from the half-moon window, slowly attempting to dry off, high in a Grevillea, as we ate breakfast on Saturday and Sunday both. The Ruppel’s Robin-chats have young despite the depradations of the feral cats who lynched a baby squirrel, who’d fallen from our roof space, on Saturday lunchtime. And their chief acoustic adversaries, the Spotted Morning-Thrushes, sing so loudly in the window that it actually makes your ears ring! Two pairs of ‘Baggies’ (that’s reichenowi Baglafecht Weavers) act as if they’d like to nest in the kitchen to save any commuting. I think we now have five pairs in total in the garden, such that they are almost becoming semi-colonial. Common Waxbills appeared today, for the first time this year, outside this window, it must be seriously damp. 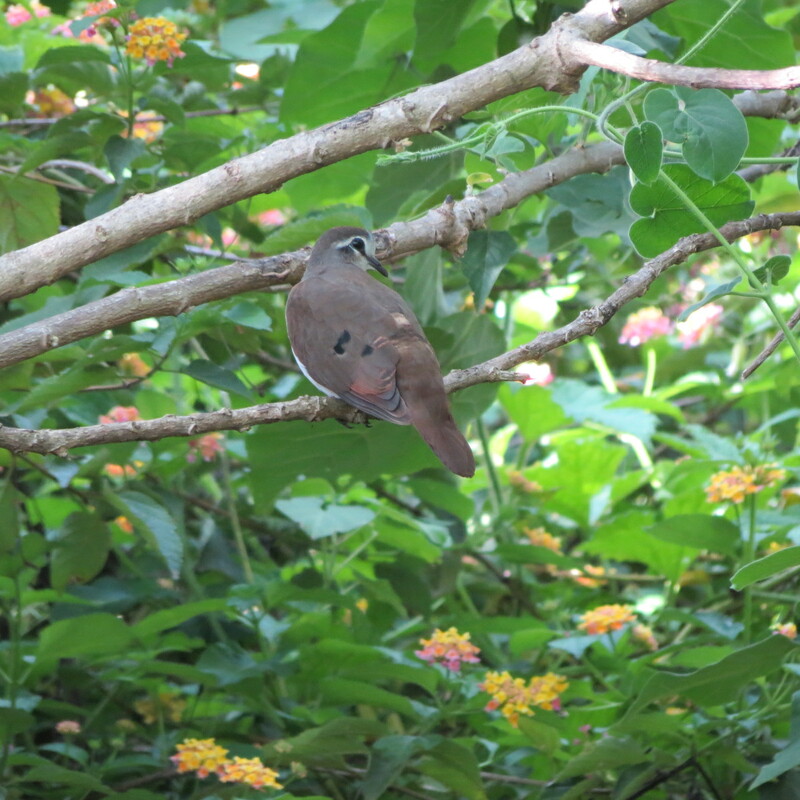 Toward the end of April two Tambourine Doves were seen, and on consecutive days, the female stayed for nearly a week. Only two previous records in eight years, both of immatures in May-June. Belatedly we fear what will happen as our pollinators are poisoned by our farmers. Unwittingly most farmers are the foot soldiers of the “Murdoch-Men” – the Agri-Pharma-Media-Bankers. Maybe it’s because of prejudices concerning “poo” that most of us have never noticed, let alone challenged, the demise of our Dung Fauna for the sake of the massive profits to those who peddle death. To kill parasites farm animals are zealously over-medicated. 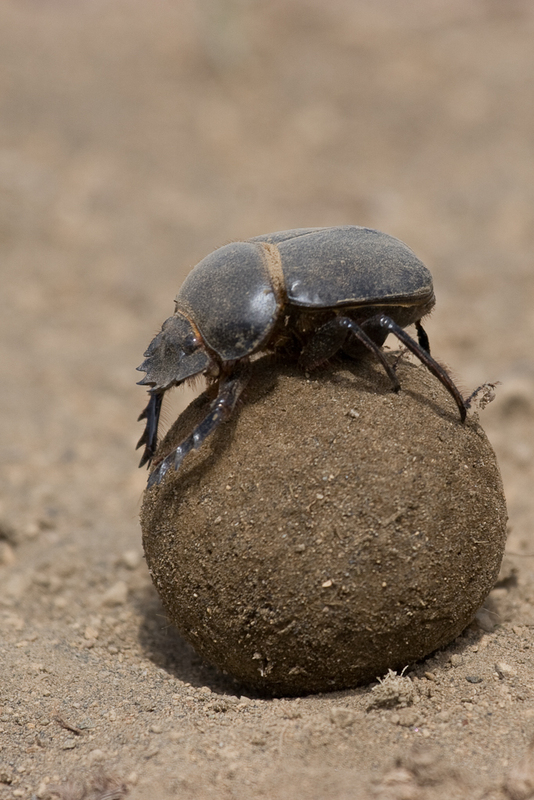 Their toxic dung is then consumed by hundreds of species of dung beetle and dung fly. All around the world these insects are then killed-off by the veterinary poison that remains active in the poo for months. Active, toxic, deadly – for a period that exceeds the life-cycle of most of the dung fly species and many of the dung beetle species too. This cleanses whole invertebrate communities from “our land”. In turn this means there’s much less food for the Hoopoes, for the Rollers, for the Swallows and the Wagtails and for the Shrikes. 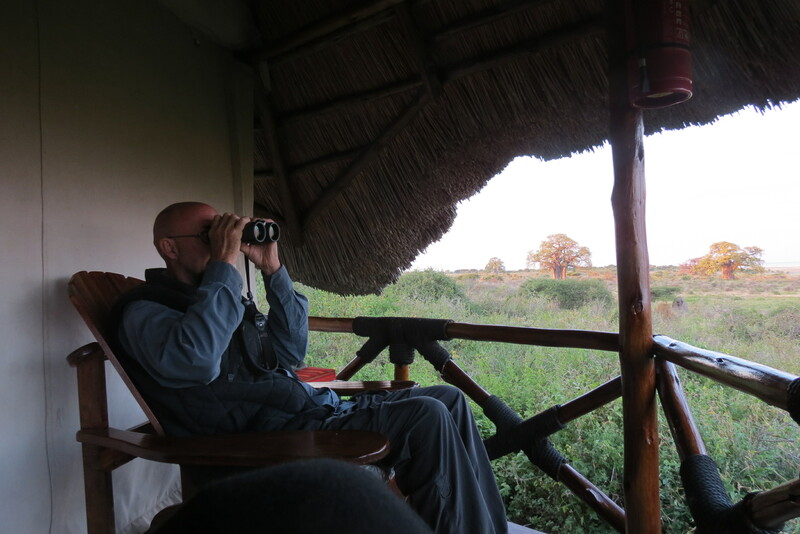 In twenty-five years from Laos to Scotland, and from Spain to Tanzania, I’ve been fortunate to compare a thousand different ‘plots’; including many that were “nature reserves”. Searching for insects and birds in places where the cattle and sheep were heavily medicated and in many where the animals were untreated. Pastures where the animals were untreated, (in some reserves and on common lands near poorer people’s homes) had far more insects and hence far more migrant birds. By contrast across those lands where the cattle were treated with e.g. the dung poisoning “Mectins” there was scarcely a swallow, a shrike or roller to be seen. Even here in wonderfully rich East Africa. Shocked, in Scotland, I once noted that these toxic dips and drenches were even being used on animals, and sprayed onto the farm-yard ‘midden’ (dung heap), inside an RSPB reserve where threatened Red-billed Choughs and Corncrakes were trying to breed. These two wonderfully evocative pictures are courtesy of the mighty – Zul Bhatia photography !